Home - From the East to West coast of Britain, now to Paris! From the East to West coast of Britain, now to Paris! Never wanting to overlook the next challenge, James Wilson, Production Director at Anglian wanted to do something different and have a change of scenery from the Bobby on a Bike route from last year. As we write, the team are en route to the ‘City of Light’ and will be riding from the 9 – 13 July. We hope that you will give them your support. 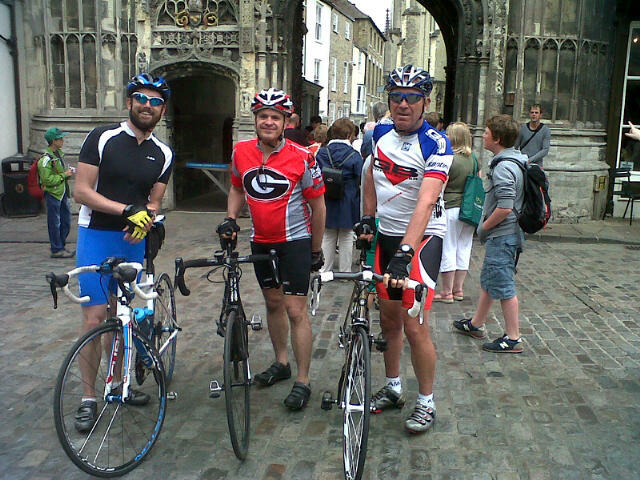 Here James tells us about the ride and the charity he and the other riders will be supporting. “For those I haven’t passed this on to yet, over the next five days I’ll be cycling from Ipswich to Paris for a charity called Suffolk Young People’s Health Project with a small group of other riders. The ride is being organised by Nicky Hunt, 2 x Commonwealth gold medallist in Archery. There will be five riders (including me). The journey will take five days covering 330 miles and it is hoped that individually we will raise £1000 each towards the charity. The charity provides practical help for teenagers and young adults in Ipswich through offering counselling, money advice, sexual health, washing, drying and cooking facilities. The ride is being supported by Neil Smith, founder of the Bobby on a Bike charity and the organiser of the mad East to West Coast ride I managed last year, except we finish at the Eiffel Tower this year rather than Aberystwyth! If you feel like making a donation towards this cause, as many of you were so generous last year (and some already this year), go to my sponsorship page. The Anglian blog team would like to say ‘Good luck’ to all the riders! Keep an eye on the blog or the Anglian twitter feed to see how they’re getting on.